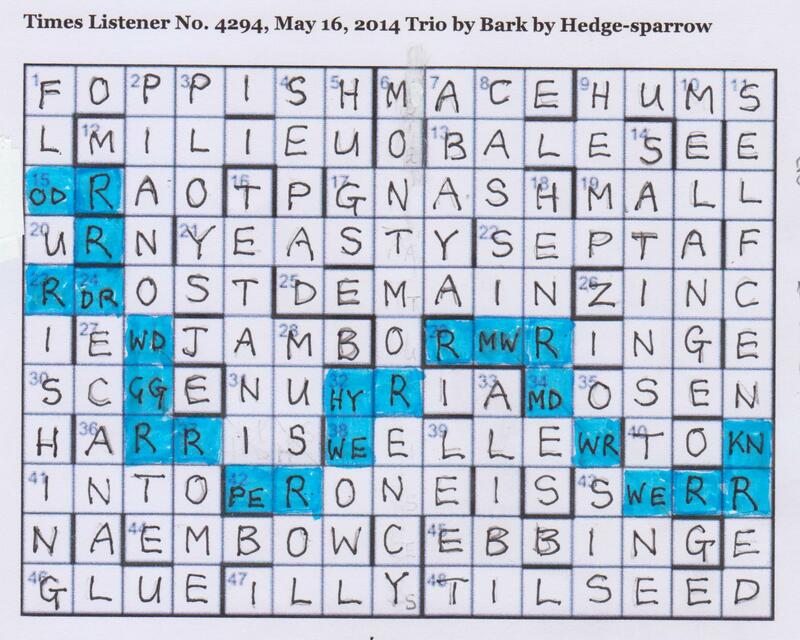 I think it is the third time that we have actually spotted the theme of a Listener crossword before entering a single clue. A friend commented to me just this week that a title that might lead the solver to the theme should perhaps be changed: but should it? I would love to hear some setter and vetter views on this. For us, at any rate, the knowledge, from the start, that this crossword was probably going to have a representation of the Thames, with Harris, Jerome, George and Montmorency, then some of the Thames towns and some kind of ‘thematic representations’, was magic and really enhanced our solve. I did the usual Numpty scan through the clues to check that Hedge-sparrow was reserving his place with the Listener Oenophilic Crew, and, of course, he was with “Base beers in [disposable] packages (5)” (BALES) and “Renders unpotable soft Sauternes I’d drunk (11)” (SAUTERNES ID* = DENATURISES). It also emerged from a speedy scan of the surface meanings of the clues, that there was a fine smattering of evidence that we were indeed with three men and a dog, in a boat: fish terrine, bass beers in disposable packages, using paddle, steer, alligator’s snapping bite (? ), vessel heading off to beat to windward, fish, tough chicken, drift around, stream, waterway, barge – it was all there. The solve was speedy and enjoyable with such unambiguous clues and we soon had a full grid with HARRIS, GEORGE and JEROME appearing, as expected. The first delighted pdm. came when I fed MONTMORENCY into the only 11-letter light where we didn’t have a clash – right down the centre column, of course, where we had put that generous anagram of the Sauternes, DENATURISES. I laughed out loud when only real words appeared (as, of course, they should in a Listener) and had to check that ILLS becoming ILLY was in order, as, of course, it was, as an archaic form. 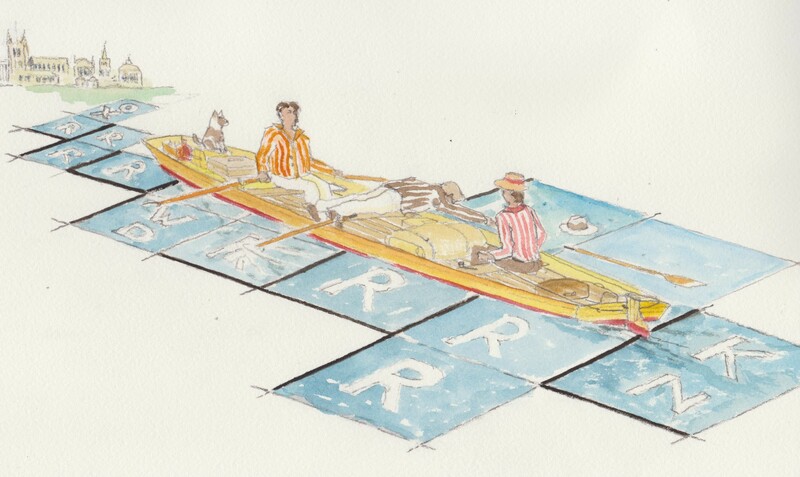 Some time before, we had noticed that there were lots of Rs appearing in our grid, and a quick count established that with the clashes that had emerged as we filled the grid, there was a snaking River Thames crossing our grid that totted up to 23 letters. Early on, we had guessed at EXTRA WORD PAIRS AT CLASHES and had realized that we had to USE FIRST AND LAST LETTERS (with a few interspersed letter pairs that, at this stage, seemed to be gobbledygook). Now we worked out that we were finding the remaining letters of our message from the clues that were not involved in clashes and that those gave us CLUE THAMES TOWNS. Nice! So we had to work out twelve mini clues of real Numpty ‘Stripey horse (5)’ style to identify twelve towns and enter their first and last letters in our grid where we had clashes. Of course Google provided us with an appropriate map. 23/24 Dung-beetle – city. DOR + CHESTER = DR – and so on, right to Pieces – weight at 40/11 KINGS + TON. This was just about my solving level and great fun, thanks Hedge-sparrow. This entry was posted on 6 June 2014 at 4:00 pm	and is filed under Solving Blogs. Tagged: Hedge-sparrow, Three Men in a Boat. You can follow any responses to this entry through the RSS 2.0 feed. You can leave a response, or trackback from your own site. I thought this was a wonderfully crafted puzzle, and one of my favourite books too as the source material. What’s not to like?